← Where is Asia in the European Foreign and Security Policy? Geographically, there are three obvious places to look for European-Asian contact and cooperation. The Eurasian landmass had plenty of attention so far, and the polar cap is starting to attract more interest as the ice melts on the ‘Northern Sea Route’. But maybe it is time the Indian Ocean got its share of scrutiny. After all, the Indian Ocean sees the vast majority of trade passing between the two regions – at least until the ice melts back much further. Any threat to shipping in these lanes is clearly a shared security interest of European and Asian economies. When it comes to tackling modern piracy, Asian countries potentially have a lot to teach their European partners. Japan’s PM Koizumi organised a major multilateral action in this sphere – the Regional Cooperation Agreement on Combating Piracy and Armed Robbery against Ships in Asia or ‘ReCAAP’ protecting ASEAN SLOCs against the piracy threat. Partly due to this initiative, piracy is no longer a serious problem in that region. Kaplan’s book offers a picaresque tour of points around the Indian Ocean rim, but he does not make a stop in Djibouti. However, this is where we can see a form European – Asian security cooperation starting to germinate. I am referring to the cooperation between the EU and Asian nations on counter-piracy efforts in the Gulf of Aden and the Western Indian Ocean, in which Djibouti is emerging as a new kind of maritime hub. In the ReCAAP, Singapore plays host to the information sharing system. In the Indian Ocean version, this role is being taken by Djibouti. Djibouti is also host to a new “regional center for maritime training, documentation and training of Djibouti (CRFMDE)”. This is also under consideration as a site for the EU’s latest Common Security and Defence Policy Operation, which is to provide training to increase the capabilities in the region’s navies and coast guard forces to police their maritime space. This is funded by the EU and Gulf countries, but also receives a substantial amount of funding and support from Japan. Suzuki Yoshikatsu thinks this is only part of an effort by Japan to secure a presence in the Indian Ocean. It is certainly an historic development for Japan, which like Europe has been accused of being an economic giant but a military pygmy. The fact that the Djibouti ‘facility’ as it is officially called is also the first overseas military base Japan has had since the end of WWII has not gone unremarked. It is currently used by Japan’s Maritime, Air and Ground Self-Defence Forces. This European-Asian contact on counter piracy is by no means restricted to Japan. There is also evidence of EU-Taiwan cooperation and Indonesia-Japan cooperation in the Gulf of Aden. China’s growing interests in Africa coincides with the PLA Navy’s ‘far seas’ strategy, and Beijing is also a noted presence in the area. The ROK also drew some attention for its Special Forces very effective operation against pirates who took one of its flagged ships. Naturally India is involved too. Asia’s Navies make up a significant proportion of the some 30 nations who have warships in the area. 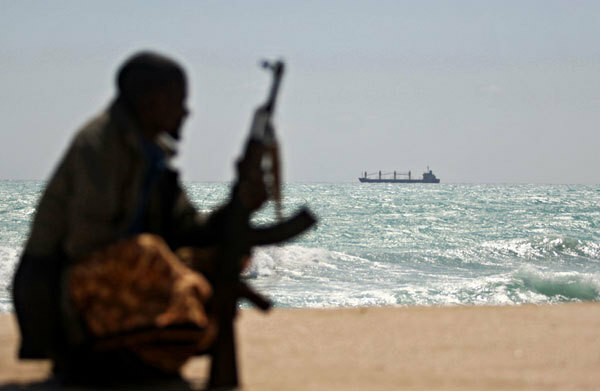 Until effective action on the ground in Somalia, the causes of piracy are unlikely to go away any time soon, so could the presence of Asian navies in this region prove habit-forming? To take conspiracy theorizing a step further, could the piracy problems emanating from Somalia be seen as a rather convenient justification for Asian navies to become a more permanent presence on the seas China’s Ming era Admiral Zheng He visited 600 years ago? It could go either way, of course. More multilateral cooperation against piracy could have a confidence building effect between European and Asian navies. At the same time, the ongoing operations provide an opportunity for navies that maneuver carefully around each other in the South China Sea to observe each other in action. ‘Know yourself and know your enemy’ as they say.